Bakery Co.* is a multi-billion dollar food processing company that produces a popular breakfast biscuit (and several variations) consisting of rolled oats, rye flakes, various flours and other ingredients. These recipes, while nothing too complicated, became difficult to scale with Bakery Co.’s existing process system and production managers were experiencing quality control issues prior to MPE’s involvement. Bulk bag unloaders for large quantity ingredients feature paddles and spout elongation devices for continuous flow of product exiting bulk bags. Spout seal plates securely fasten for no leakage. Also a dust collector and return line was installed with differential pressure switches that can be monitored from the transport control system (shown below). MPE batching and transport control system sequences up to four separate batches with zero cross contamination. The conveyor runs automatically when each batch is ready for transport and turns off when not in use, thus saving energy. 3000 lb bulk ingredient storage hoppers are fed from a Chain-Vey above. They have high angle walls and vibrating bin bottoms to ensure consistent outflow of dry ingredients to loss-in-weight feeders with accuracy within 0.1%. Accurate ingredient amounts are discharged into a Chain-Vey without the need for air-locks. 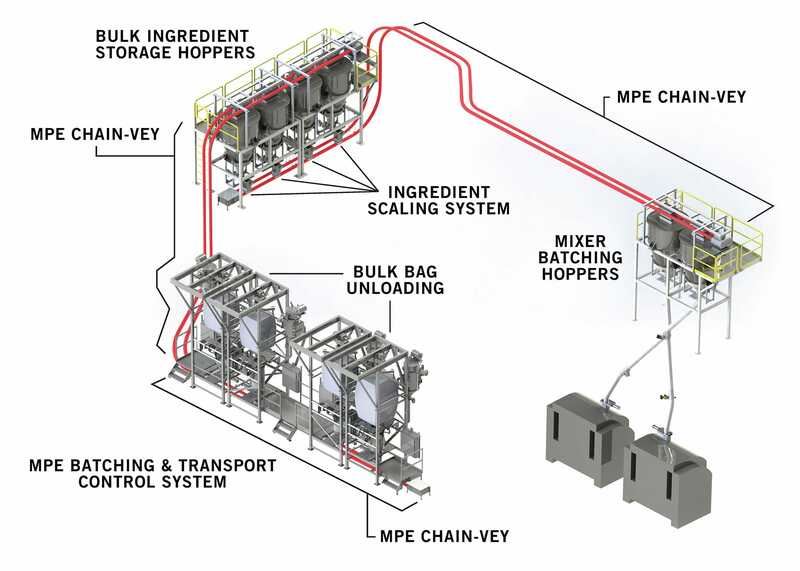 This second Chain-Vey system is 240 ft in length and carries measured amounts of ingredients to the mixer hopper. The importance here is that unlike many other conveyance systems, Chain-Vey ensures virtually zero product loss even in fine particle applications; an important consideration for adhering to recipes. The system above the dry mixer hopper utilizes minimal clearance of only 24 inches between the hopper and ceiling. A second scale system records the receipt of each ingredient which is reported to the batching and transport control system. 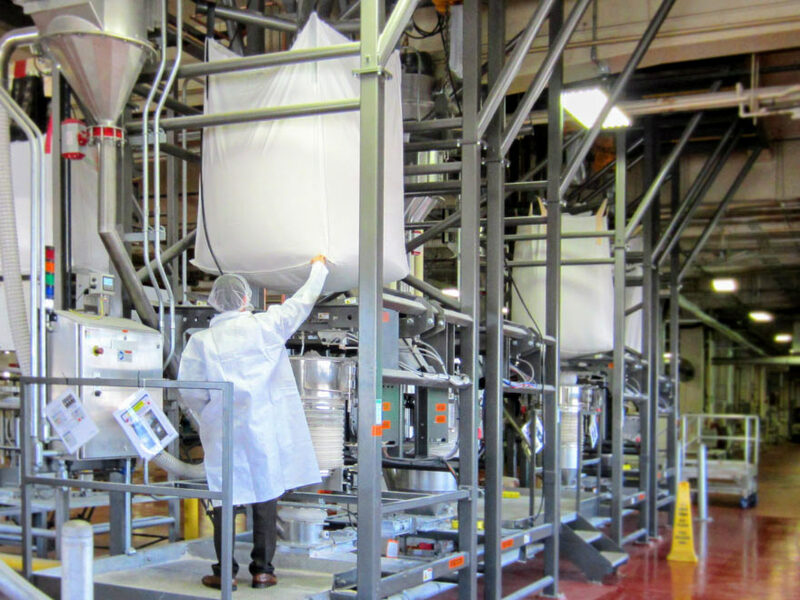 Bulk bag ingredients are quickly unloaded with no waste and efficiently transported to interim storage; ingredients are then accurately measured and transported to the mixing hoppers; product integrity is maintained during transport from mixers to the final bulk bags; all at a fraction of electricity usage and noise pollution. Meanwhile, Bakery Co.’s breakfast biscuits never tasted better. *We substituted our customer’s real name with the fictitious name Bakery Co.